CROSBY The 13th annual Crosby Czech Fest will take place Sunday, Oct. 2, at the Crosby Fairgrounds. The event is sponsored by Sacred Heart Catholic Church and the Czech Heritage Society. New this year to the Czech Fest are several fun game booths for the kids. The kids willl enjoy new and old games, a moonwalk and slides. While adults enjoy the bingo and the live auction that begins at 1 p.m.
Our live auction will feature several experience trips including a crappie fishing excursion and a Mother/Daughter day of fishing with everything in pink camo, including the boat. Featured entertainers are Texas Sound Czech, Heritage Singers and Marilyn Sikora Dancers. The day long event includes homemade kolaches, barbeque plates, lots of game booths and inflatables for the kids, a super live auction, and a Czech band and dancers. We begin serving the food at 11:30 a.m. and the auction begins at 1 p.m.
Everyone is invited to come out to enjoy a beautiful fall day celebrating Crosbys Czech heritage. Dozens of local kids and adults took a unique tour through San Jacinto Methodist Hospital during the facilitys annual Teddy Bear Clinic, held Sept. 24 from 11 a.m. to 3 p.m. Throughout the event, the childrens patients  stuffed animals of every shape and form  were given the utmost care by members of the hospitals staff. The goal of the program is to take some of the scariness out of being admitted and treated by the hospital. Outside the hospital, representatives from the Houston Dynamo professional soccer team gave youngsters a chance to shoot a soccer ball past a goalie in an inflatable tent, while carnival games, snow cones and face painting were also up for the taking. Representatives from Baystar Ambulance Company were on site to give tours of an ambulance as well. Once inside, children and their patients went through a step-by-step process. First their toys were admitted to the hospital, with representatives asking what symptoms the stuffed charges had; were they sick? Did they have an accident? What was ailing them that day? From there, the stuffed animals were taken into assessment, where tests were given to determine what their symptoms meant. Temperatures were taken, reflexes were checked, and then the children took their patients onward through the process. Children saw how the hospital staff administers intravenous fluids, and how they check actual patients respiratory systems. 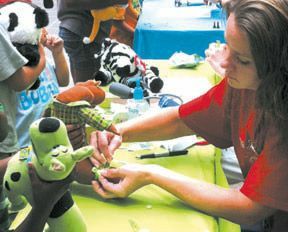 Staff were on hand to put pretend casts on stuffed toys that may have taken a tumble or two, and representatives from the hospitals dietary division gave tips on healthy eating, both for the kids and their toys. Ultrasound technicians examined the imaginary contents of the patients stomachs, and pharmacy staff put on a puppet show that illustrated the importance of taking medication correctly. Representatives from the Baytown Police Department were there as well, measuring the kids height and weight and providing the opportunity for families to pick up identification cards with their childrens vital information and photo. Though the event was held with tongue in check, it does serve a valuable purpose  showing kids that the hospital is there to help them, and to relieve some of the fear that can come with a hospital stay. For more information, call 281-420-8600 or visit www.methodisthealth.com. The Chambers County Commissioners Court will conduct a public hearing to hear the progress of the District Clerks Records Archive Fund, Senate Bill 1685, to fund the preservation and restoration of the District Clerks records. The meeting will be held on October 11, 2011 at 10:00 a.m. in the Courtroom of the Chambers County Courthouse, Anahuac, Texas. 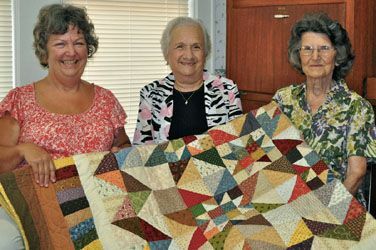 HIGHLANDS 56 Years ago, the first Jamboree was held on Main Street in Highlands, celebrating the opening of the new Highlands State Bank, and in many ways the coming of age of the community. Thousands attended, welcoming the bank and the awakening of this town. After skipping a year, Highlands has held their Jamboree celebration every year since. It currently is a function of the Greater Highlands Lynchburg Chamber of Commerce, with proceeds benefitting their projects during the year. Almost everyone in town participates in one way or another, and there are plenty of events to partake. The theme of the Jamboree this year is HIGHLANDS — A HIDDEN TREASURE and floats and booths are asked to carry out a pirate theme. Events include a Fun Run/Walk starting at 7 am at the Community Center; a Parade at 10 am on Main Street; then at the Elementary School Crafts Booths, Car Show, BBQ, Childrens Pageant, Silent Auction, and Entertainment of various sorts by local groups. In conjunction with the Jamboree day, the Highlands Horizons will hold the Miss Highlands and Jr. Miss Highlands pageants in the Junior School auditorium. Prizes will be awarded for best parade floats, and best crafts booths. In addition, the Car Show, with exhibits from local enthusiasts, will make awards too. Ellard Lambert will show several of his restored autos, always a treat. HOUSTON  Beleaguered Precinct 4 Commissioner Jerry Eversole submitted his resignation to County Judge Ed Emmetts office Monday, and according to his letter he will be officially step down Oct. 1. Eversole represents approximately one million residents in Harris County, including the Huffman area. He has been in the office for six consecutive terms, having been elected to his final term in 2010. The commissioner has been in and out of court for months facing corruption charges, brought from allegations that he accepted money and gifts from a friend in return for providing contracts to companies his friend, Michael Surface, was financially involved. His latest court appearance resulted in a hung jury and a mistrial, but he is due back in court in October. Eversole has always denied any wrongdoing. Eversole has faced criminal charges in the past as well; in 1993 he was charged with perjury and unlawful record keeping, but those charges were dropped. 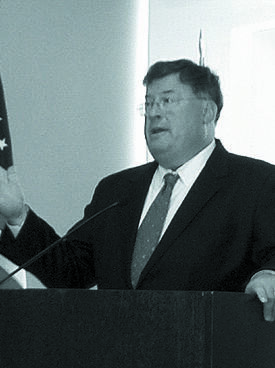 He was also fined $75,000 by the Texas Ethics Commission in 2009 for violating campaign finance laws. Judge Emmett will select an individual to take Eversoles seat in the interim. CROSBY  The redistricting legal challenge to the Texas Legislature only mentioned some portions of Dallas although many a Houston area Democrats weighed in on the problems of not having enough Hispanic Representation. But locally in the House of Representatives the West side of FM 2100 in Highlands and all of Crosby was introduced to a new representative at the Crosby/Huffman Chamber of Commerce last Thursday. Dan Huberty, named Rookie of the Year by the Texas Monthly Magazine, introduced Crosby to Wayne Smith of Baytown as the proposed new representative for our area in 2013 unless they are swept aside to comply with the 1964 Voters Rights Act by the federal government. Huberty indicates that Smith was very helpful during his freshman year within the Legislature and that Smith knew much about the infrastructure of the Highlands and Crosby areas. Through this last cycle, through Ike, during the legal process with insurance companies attorneys were getting multiple amounts of monies from cases. Smith was interested to hear of the challenges for TXDoT in finding a new contractor to build the Overpass of FM 2100 at Kernohan and the new local enthusiasm for building another off ramp to FM 2100 from U.S. 90. Im going to take a number of concerns up with TXDot next time and I want to understand these. The West Chambers County Chamber of Commerce heard from State Senator Tommy Williams at their Sept. 13 meeting, and Williams did not mince words; things arent as bad as they could be, but numerous issues  including border security  are not as resolved as they should be either. Williams also touched on the current drought and the need for the reinforcement of Texas infrastructure. It was when Williams started discussing border security, however, that he began painting a picture of how serious the issue really is. Theres nothing that concerns me more about the future of our state than whats going on along our southern border, Williams said. I recently made three trips down to that area and saw border patrol agents trying to intercept drug dealers. Williams said that the amount of money traveling across the Texas border is close to $25-32 billion per year. 80 percent of that money is from marijuana sales, Williams said. We have to decide in our country and our state how were going to deal with this. California and Colorado have effectively legalized marijuana use, but it hasnt cut off the illegal drug trade. Border security, Williams said, isnt just about stopping drug traffic. In about a years time we capture 300 to 400 special interest aliens coming into Texas from Mexico, Williams said. These arent the folks coming here to work. These are people from Afghanistan, the Sudan, and other countries known to harbor Al-Qaeda influences. Williams applauded the Department of Public Safety for their role in securing the border. These terrorists are smugglers and traffickers. These are not nice people, Williams said. But they are scared to death when the DPS shows up. They say its because they dont know what theyre going to do, that the DPS personnel are crazy. HIGHLANDS The Chamber of Commerce presented awards to leaders in the community at their monthly luncheon last week. 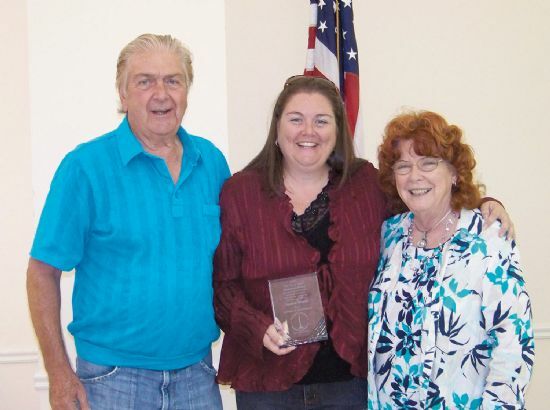 The prestigious Terry Davis Award, for exemplary community service, went to Jessica Woods for her efforts with the Chamber, Jamboree, and Partners In Education, to mention a few of her achievements. Other awards for service were: Outstanding Volunteer Firefighter, Janette Thompson; Outstanding Deputy Constable, Constable Ken Jones; Outstanding Sheriffs Deputy, Deputy Ted Douthit; and Business/Organization of the Year, Kostka Auto Body Repair, David Kostak owner. The luncheon was held at the Highlands Community Center, with president Phillip Morris. The featured speaker for the event was Traci Wheeler, executive director of the Baytown Chamber. Her talk was on membership drives for the chambers, and also the role the chamber plays in the community. The Terry Davis Award has been given for the last 28 years, to a person who works for the betterment of the community selflessly. See inside box for details on Terry Davis life. Jessica Woods, recipient of this years award, is known for her work as president of the Chamber, co-chair of the Highlands Jamboree, and chairperson of the Chambers Partners In Education program. She has held each of these positions for several years, and continues to serve the community today. In her emotional acceptance speech, Jessica said the award was especially important to her because her father had received it previously in 2006, and she was honored to follow his example. Jessica Woods is co-owner with her father of Rainbow Jewelry and Loan on Main Street. 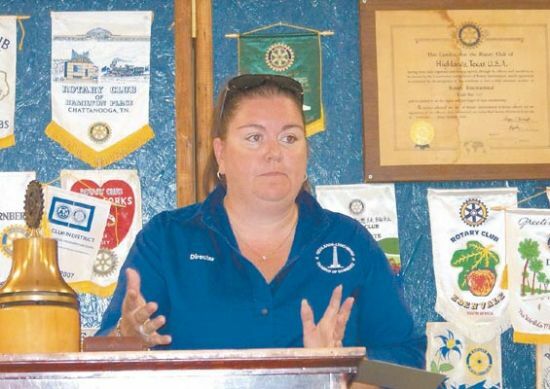 Traci Wheeler spoke about her 38 years with the Baytown Chamber. She noted that chambers are non-profit, with no government support, but that many people dont know that. The purpose of a chamber, she said, was to solve community problems, and bring about improvements. A chamber can also be the will and conscience of a community. Wheeler said that in contemplating a membership drive, a chamber should consider three aspects: one, relations; two, retention; and three, recruitment. This changes the traditional drive from simply trying to sell and sign up new members. New members should be told the benefits of membership. They can be informed of the program of work of the chamber, and told what is in it for them. They should be shown an annual report, and informed of workshops, seminars, crime prevention, and quality of life. As part of a membership drive, board members will be asked to sell 3 new members. the annual campaign will include a telemarketing session, 3 hours long per volunteer. The group will be broken into teams, with captains and 10 members per team, who will compete. Bells, whistles, clown noses and more make this a fun event, she said, and it is all over in one and one-half days. She said that this can be a very successful method for building the membership of the organization, and not a burden on any of the volunteers. Most of all, she said, members should be thanked for their participation in the chamber. They should be contacted regularly by the chamber, with opportunities to build their business. When most people think of surgery, theyre overwhelmed by a series of jarring thoughts; a packed parking lot, a noisy waiting room, no one to answer questions. For some, its easy to feel like they are just passing through, with little advice or personal care. This is not the case at the Ambulatory Surgery Center, part of San Jacinto Methodist Hospital. For starters, its quiet, serene, and comfortable. The environment is one of dedication to the patients needs. And for those in the Baytown area, its part of the neighborhood. The Ambulatory Surgical Center has been part of the hospital since the mid-90s, and has steadily grown to accommodate the needs of patients seeking surgeries of all kinds; approximately ten surgeons use the facility regularly for orthopedic work, as well as podiatry, cosmetic surgery, gynecology, pain management, and much more. Susan Sawyer, director of surgical services at the facility, is a good example of the staff on site; shes friendly and quick with a smile, willing to answer questions, and she knows her job well, having been a registered nurse for 27 years. We do just about everything here but deliver babies and perform heart surgery, Sawyer said with a laugh. Indeed, the center handles just about any kind of surgery that doesnt require an overnight stay  and plenty of them, Sawyer said. The staff tries to make every step of the process as painless as possible, Sawyer said. Sawyer and her staff believe in what the Ambulatory Surgery Center has to offer. And so do the patients who have come through the doors, if the surveys they fill out are any indication. The surveys are given to each patient as they leave, which they can fill out anonymously. And according to those surveys, the center is meeting the patients needs quite well. you feel like youre at home. The Ambulatory Surgery Center is located at 1025 Birdsong Drive in Baytown. For more information, call 281-427-4518 or visit www.methodisthealth.com. The Chambers County Commissioners Court gave their consent to a long-awaited plan for revitalizing and improving McCollum Park in Beach City during their meeting Aug. 23. The park, which has been chained and padlocked ever since Hurricane Ike in 2008, has been in need of repair for some time, and those repairs will begin shortly. Plans include the replacement of grass, maintenance of trees, and possibly replacing the existing play structures. A new list of rules and regulations are now in place as well. A 30-minute parking limit will be imposed on each vehicle that uses the new road leading into McCollom Park. Originally the commissioners had intended to prohibit any sort of vehicle traffic within the park area. The erosion barrier in the park is also off limits, according to the new rules. That means no skateboards, bikes or other playing on the barrier is prohibited, in order to protect against accidents. Drinking alcohol or any liquid in a glass container is not allowed, except for baby food and baby bottles. Also prohibited are fireworks, firearms and riding an animal through the park grounds. There is also no soliciting of food or other goods allowed in the park. Camping in the park will be allowed with written permission, and pets can accompany their owners as long as they have a leash. For more information on McCollum Park, contact Precinct 4 Commissioner Rusty Senac at 281-383-2011.